Whenever I'm asked what my favorite food is, I would always have to stop and think really hard. You see, the problem here is that I don't only have one but in fact, I have 3 favorite types of food that I love very very much! That would be sushi, dimsum and pasta. Give me any of these and I can eat it for days on end. I'm lucky that Singapore is such an awesome food mecca that there's pretty much a very wide array of food choices available all the time. Take dimsum for example. Yes, I do admit that Hong Kong still reigns as the dimsum capital of world but when it comes to Xiao Long Baos, then Singapore is pretty much ahead of the pack. What are Xiao Long Baos? It's a delicate, hand-created dumpling that is filled with pork and a small amount of soup. Steamed to perfection, the beauty of xiao long baos is that the soup stays intact even upon serving. So, there's one way to eat this -- carefully lift a piece using your chopsticks making sure that you don't break the delicate wrapper and place this on your soup spoon. Now, carefully take a small bite to poke a hole and it's either you let the soup flow into the soup spoon or you drink it straight. I love dipping my xiao long bao is this special ginger-black vinegar-soy sauce mix. Just a small amount to add some flavor. Paul, on the other hand, wants his with loads of shredded ginger and the amount of the soy sauce and vinegar is enough to fill one soup bowl. So, one Sunday evening, Paul and I met up with cousin J for dinner. Coincidentally, we all purchased a Groupon coupon where we can eat get a set of Flavored Xiao Long Baos (S$14.80/8 pcs) from Paradise Dynasty. Here are the different flavors available: Original, Ginseng, Foie Gras, Black Truffle, Cheesy, Crab Roe, Garlic and Szechuan. Each flavor is color-coded making it easier for patrons to follow. My favorite would be the Original, the Foie Gras but I felt like that have only added in a teeny tiny bit, the Black Truffle, Cheesy and Garlic. I was excited for the Crab Roe but sadly I found the taste to be very weak to be enjoyed. 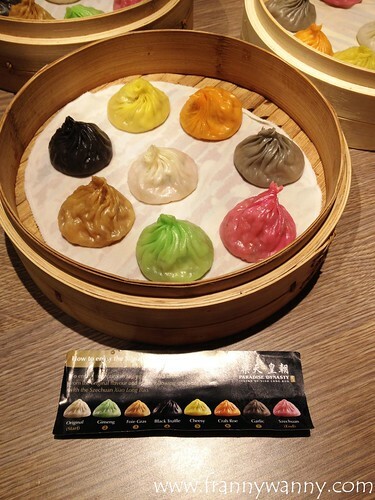 I'd say, this is nice and pretty to enjoy but it's not still the best xiao long bao in town. Definitely fun to enjoy with friends as you can choose your personal favorites. 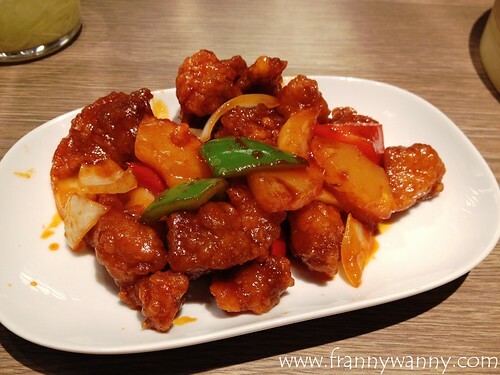 To go with our xiao long baos, we tried the Crispy Sweet and Sour Pork which was pretty good! 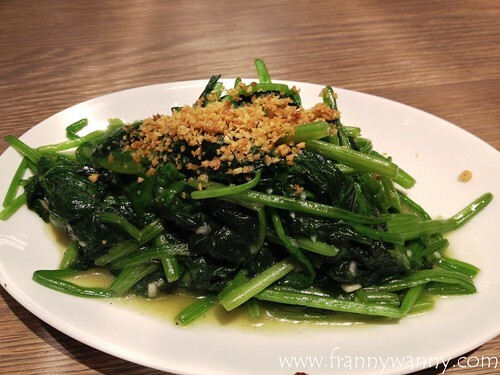 J is such a healthy eater so he made sure we eat our veggies but getting the Sauteed Spinach with Minced Garlic. I liked this very much that I think I ate half of the plate. Oops! 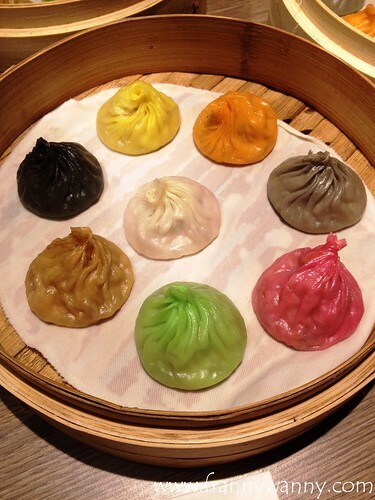 Paradise Dynasty is really known for its 8-piece flavored xiao long bao. It's good as a novelty as it's really colorful and something very interesting but if you're in for the real thing then I have yet to be impressed with Paradise Dynasty's version. 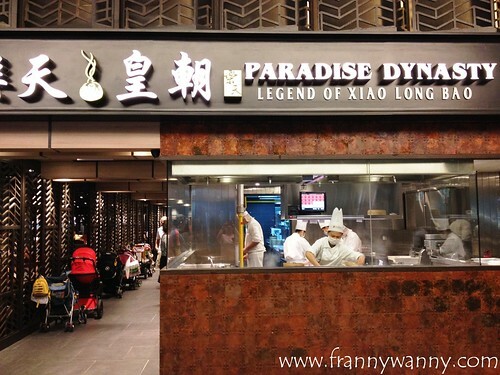 Paradise Dynasty is located at 1 Harbourfront Walk, #03-08A, Singapore 098585. Call them at 6376-8103. They have 5 other branches all over Singapore. Hi Lea!! Okay I'll give those a try :) Thanks for the reco!! You should try the authentic xiao long bao in one of the night markets in Taipei, Taiwan. I am sure you will agree that they do it better.